Hunter S. Thompson’s letter to Hume Logan on finding your purpose and living a meaningful life is one of the most popular posts to ever appear on Farnam Street. 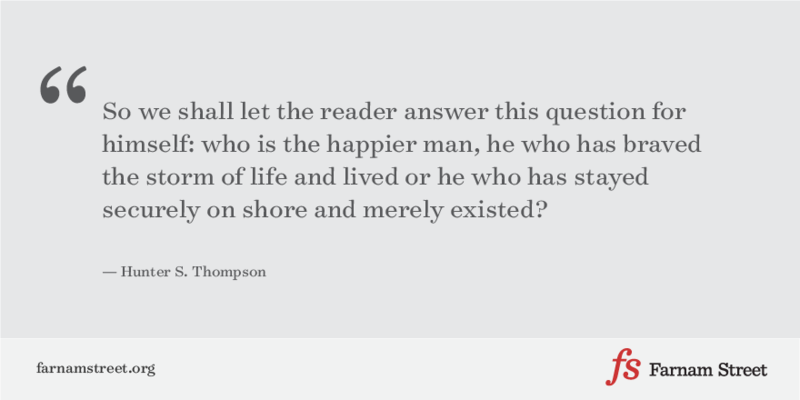 One reader found it so valuable he dug into Thompson’s work in search of more wisdom. He ended up printing out a copy of Thompson’s “Security” and mailed it to me. Thompson, for his part, lays out some timeless wisdom yet again. Security … what does this word mean in relation to life as we know it today? For the most part, it means safety and freedom from worry. It is said to be the end that all men strive for; but is security a utopian goal or is it another word for rut? In April of 1958, Hunter S. Thompson was 22 years old when he wrote this letter to his friend Hume Logan in response to a request for life advice. Thompson’s letter, found in Letters of Note, offers some of the most thoughtful and profound advice I’ve ever come across. Still curious? Letters of Note is full of unexpected awesomeness.